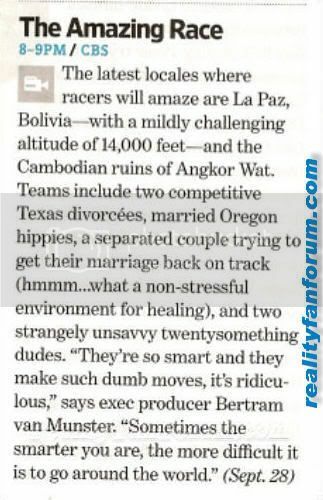 Let split this off into its own thread so we can speculate ..
Van Munster, who is currently scouting locations in Asia for the 14th season, promised the 13th season will include a series of firsts for the reality competition, including a mistake that ultimately prohibited one team from joining their fellow racers at the finish line, as well as a memorable first-ever stop for "The Amazing Race" in Cambodia. ok, party's over - unwinding here! just remembered that i saw phil on NBC Extra yesterday being interviewing in his home office - just briefly - but i do remember one significant thing he said which i don't think has been mentioned here before - he said " one team lost some important documentation and some valuables that was ultimately detrimental to their situation in the race, not good not good at all", and then "we make sure everybody gets home safe and sound". so i'm not so sure about the portland mixup scenario anymore, seems like one team lost (left somewhere or had it stolen) their fanny pack with all their clues and their passports + credit card etc and that's why they don't make it to the final 3.
finally a good quote "New places and new faces make for Amazing Races"!! it can be something completley random like: One team who has already been eliminated gets arrested and cant cheer for the f3.... doubtful lol, so Ill go with -- a guido type error where they fall so far behind that they dont even make it to the finish mat. Maybe they have a car accident in a country where circumstances of seriousness and fault might lead to mandatory jail time! a guido type error has happened before though, my first thought was that it was a team in the final 3 but now I really don't know what to make of it? cheating at something, breaking a rule, and getting caught and getting thrown out? I remember like for one instance the dude that flew with the teams to India wrote that a couple asked him for his travel book and when asked why they said they were on a ..
Just taking the words at face value "makes an unprecedented mistake on the road that ultimately prohibits them from joining their fellow Racers at the finish line", can mean that a non-eliminated team made a mistake, got eliminated, and couldn't even get back to greet the winners at the finish line (in Portland). Or maybe not. Or BVM is playing with words...AGAIN! I say the Communists ate them. I posted this in the speculation thread .. just adding more to my theory that the team that made the mistake maybe Superbad but I hope not, I like them. There are a few Portlands in the US. That's a good guess that they went to Maine instead of Oregon. I have looked at this for quite a while now; the conclusion I draw is that van Munster has created a mountain out of a molehole. There are 11 teams that are due to show up for the Finish Line. Only 3 of them are still competing. I see a 8/11 = 73% probability that the only impact of this unprecedented mistake is that one of the already-eliminated teams is not present at the Finish Line. There is a 27% chance that one of the three Finalist teams is impacted, which would have the result of being only two teams able to compete for the Finish Line. So, I think this is a classic misdirect play by van Munster. I can't agree with you apskip. All of the sequestered teams are kept together and led by the nose to wherever they have to go and whatever they have to do. No free loaders here. Even the last several eliminated teams are kept under wraps by production people (what the heck are interns for anyway). So I think it is a 100% probability that all eight eliminated teams will be brought screaming, lock, stock and barrel to the final mat in Portland. The idea that one team gets a plane from Frankfurt to Portland Maine (via Boston) is a very real possibility and would be a real, old fashioned, hoot. Spotting one team and cameracrew late in the day (6:00PM) might very well be the team who went to Portland, ME first, and then retreated to Boston and caught a late plane to Portland, OR. With a three hour time difference between the two Portlands, this is really possible and would account for one team being spotted so late in the day. Anyway, its food for thought. I did a Travelocity check of flights from Moscow to Portland, Maine, leaving on a Wednesday and it looks like a lead team could catch a very early 5:40 am flight from Moscow's DME to Munich to Chicago to Portland Maine, arriving at 4:26 pm. Since that would not give them time to get to the other Portland by 6:00 pm I looked into the chance that they could have discovered their error while waiting at Munich. They would get to Munich at 6:55 am, their flight to Chicago would leave at 9:00 am giving them plenty of time to research the clue in hand and determine their error. (isn't this fun Gman! kinda like the extra vehicle we saw in TAR8) In their Deutsch-downtime they would scramble to catch a flight to Portland, Oregon. And guess what? Travelocity says they could do this: Keep taking that flight to Chicago leaving at 9:00 am and arriving ORD at 11:40 am. From there they can take United 929 leaving ORD at 3:25 pm and arriving in Portland PDX at 5:41 pm. Too bad they arrive at ORD a little too late to catch UA 581 leaving at 11:55 am and arriving PDX at 2:14 pm. It is possible that a travel agent screwed it up for whichever team is affected and booked them flights to the wrong Portland. At this point it would be easier to rent a car and drive 2 1/4 hours to Portland ME, but Amazing Race rules do not allow it unless a team is getting a Guido exit. Flying from Boston to Portland is one of those "you can't get there form here" situations as there are no nonstops in the right time frame. Leaving after 3pm there is no combination of flights that gets anyone to Portland ME until 11pm at the earliest. If a team made the mistake and discovered it in Boston airport, then there is a nonstop Alaska Airlines 31 dep. BOS 1635 arr. PDX 2005. 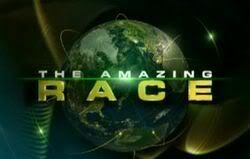 Scuznek, in the entire history of the Amazing Race no team has ever had a significant lead over the second place team going into the final leg in a single leg Finale as teams are bunched to guarantee a nearly equal start by WRP policy. In some double leg Finales, there was a lead that evaporated when the bunching happened to equalize the start of what could bge considered the latter leg. Reichen and Chip in AR4 had the best lead, maybe one hour in Hawaii, which gave them an edge after they landed in Phoenix. So, a significant lead heading into the final leg is highly improbable. We know that at least 2 teams get onto the plane in Moscow to fly to Frankfurt and then on to Portland OR, so I would say that it's a sure thing. 1. Gary and Dave in that same AR4 went south 1500 miles to Sydney instead of in the correct direction north(before turning east in Japan (I took the Reichen/Chip and Jon/Kelly route to return from Cairns 17 months ago). 2. The famous Alaska scene in AR1 when Joe/Bill were 24 hours behind the 2 leaders. 3. Lyn/Karlyn in AR10 could not get on the best plane first from Paris to New York and had to go via Newark maybe 90 minutes behind. 4. In AR6 Adam and Rebecca got to Chicago maybe 90 minutes behind the other 2 teams. 5. In AR7 Ron and Kelly nmade the single wrong turn near the San Juan International Airport and got to the Miami area about 90 minutes behind. 6. Ray and Yolanda were an unknown amount (but mabye an hour) behind at Red Rocks Amphitheatre.